Well, folks, the big holiday is nearly upon us. I’ll have one last regular deal post for you tomorrow, but that’s going to be it until the calendar hits 2019. You’ll still get your daily dose of Cheapskate during the break, but it’ll be stuff I’ve queued up in advance. 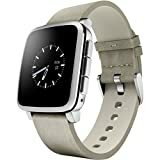 Speaking of awesome, check this out: Today only, and while supplies last, Macy’s has the Fitbit Versa for just $89.99 shipped (plus tax). That’s for the black version. It’s also available in peach and in gray for the same price. Update: Amazon just matched the price on the black model, but shows a shipping timeframe of 1-2 months! Update No. 2: The Versa is now sold out at Macy’s, but Amazon still has the black one at $89.99 — though still backordered till at least January. Update No. 3: This deal is dead everywhere. Nice while it lasted! Pro tip: Cashback service Ebates is currently offering six percent back at Macy’s, and I don’t see any exclusions that would leave out the Versa. That would bring your net total (not including tax) down to $84.60! These are guaranteed to sell out quickly, because the Versa normally runs $200. During Black Friday sales, it could frequently be found for $150. But $90? That’s an all-time low, and by a lot. Wearing Fitbit Versa: Does it beat Apple Watch? At $90, I’d say those limitations are even easier to live with. Hope you’re able to grab one of these, because this is without question one of the best smartwatch deals I’ve seen in 2018. Bonus deal: Here’s a buy-one-get-one (BOGO) deal that’s good for your brain — and for a gift. The average class spans 24 lessons, each an average of 12 minutes long. So these aren’t just abbreviated YouTube videos or TED Talks. These are actual classes taught by people at the top of their game. Sounds awesome to me.